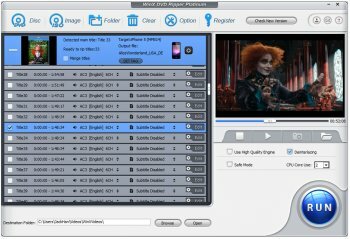 WinX DVD Ripper Platinum is an all-in-one DVD ripper software capable of ripping both DVD disc and DVD ISO image to mainstream videos, such as rip DVD to AVI, DVD to MP4, H.264, MPEG, WMV, MOV, FLV, 3GP, etc. It can also convert DVD (including encrypted DVD) to iPhone/5/4S/4, the new iPad/iPad 2, iPod/touch, Apple TV, Android, HTC, Samsung, XOOM, Galaxy Tab, PSP, etc. Moreover, this program brings you No.1 fast DVD ripping solution in the market thanks to the cutting-edge technology to support Multi-core CPU (maximally 8-core processor) and Hyper-threading. Meanwhile, WinX DVD Ripper Platinum has innovative DVD copy modes to meet users' update-to-date DVD backup demands - clone full DVD disc to ISO image; copy full title to multi-track MPEG2 file with all videos/audios/subtitles; backup main content of a DVD for playing on PC, Android,PS3, Xbox, Media Center, etc. The latter two copy modes cost you 5 minutes only. The latest version is 7.5.2, @Fileforum, could you please update it to the letest version? I believe our users will get much surprise from it! @Betanoob You are a total IDIOT. You VERY obviously NEVER tried the program. I, on the other hand have. Got it FOR FREE during the 2013 Halloween Giveaway on their site. It is an ABSOLUTELY EXCELLENT program. It works wonderfully to rip DVD to various formats, as well as to image and straight rip to hard drive as well. I would recommend this to anyone..period. Note (again @ Betanoob) PLEASE try the program BEFORE making foolish, and ignorant comments on the reviews. Thank you.. I must say that I have been extremely happy with this software. The interface is so simple! I am not a computer smart, but i can easily operate it! Maybe “Use High Quality Engine” takes into effects, I clicked it!